Louisa Fleet Recruitment : Are you crushing the soul of your salesforce? 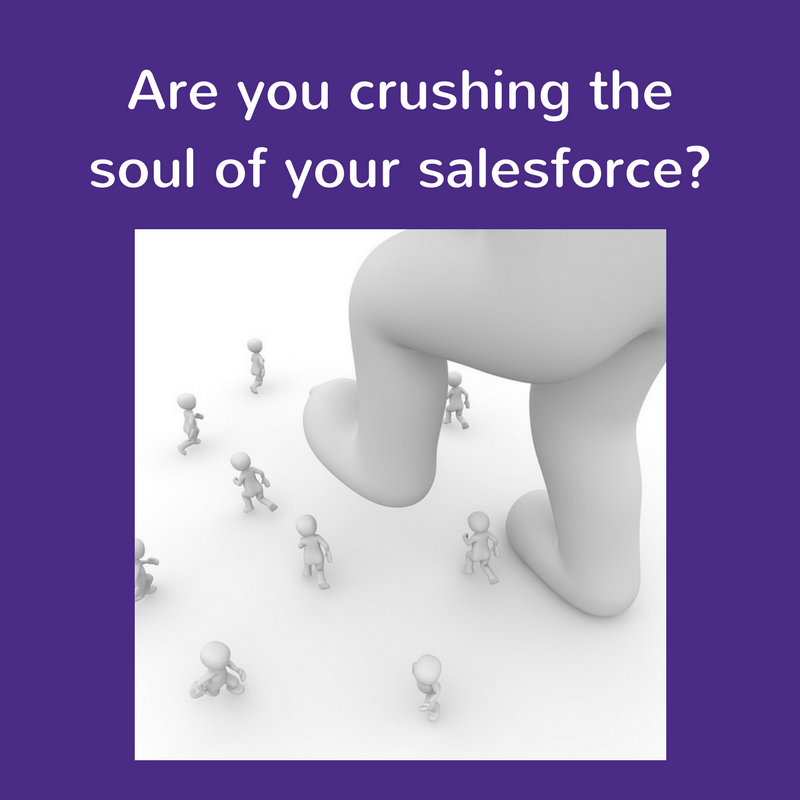 Are you crushing the soul of your salesforce? I have worked in sales recruitment for longer than I will often admit and it is amazing at how the role of Field Sales Executive/Manager has evolved in that time. Remember when we didn’t all have technology at our finger tips and phones dangling from our ears? Yes, back in the day, when we had to give implicit trust to our regional sales team during the day, rather than being able to keep in tight contact. When I interview regional sales people the same requirement comes up time and time again. How can you become accountable? I feel passionate that the secret to a successful field sales management strategy is to not micro manage your team. Sales people are independent and driven people, if crowded and forced to report back every second, you will often be guilty of dampening their spirit – or as one candidate once said, "crushing his soul"! Give your sales team your time rather than your demands. Commit to spending time with them in the field, shadowing, coaching and developing. Know the character you are working with and their motivators. Use this in feedback to help drive accountability. Each sales person is different, and as a business manager knowing the talent of each individual will help you be able to push them to achieve their full potential. Create solutions for areas they are not as strong in, but don’t micro manage them to perform outstandingly in this area, no one is perfect. Want your sales team to fly? Then give them the tools to do so. Training and coaching a team for success is a proven working recipe. Take the time to coach, train and mentor your team rather than micro manage. Use KPI’s to measure performance and reward. Demonstrate that you trust your team to run their area as if it was their own business and you will find the return is exactly what you want! If you attempt to make someone accountable, but spend the whole time watching them work and letting them know you can do what they do more effectively, then you will create a disengaged workforce. Let your salespeople know their objectives and where they contribute in the business and you will get engagement. You can keep in touch with us on Twitter, Facebook and LinkedIn too!